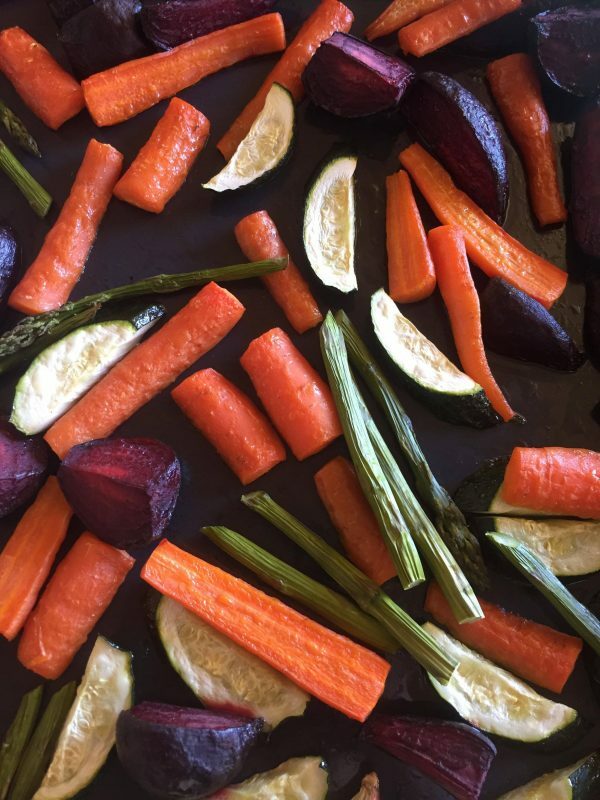 As we head into the cooler months, this Roasted Vegetable Salad is an easy and tasty dish to throw together. What’s more, it is beautifully vibrant: lovely to take to a family get together. Alternatively, it could be a substitute side to pair with your favourite cut of meat for a weeknight meal. This is a handy salad to revitalise any tired -looking vegetables in your fridge or pantry. The simple lemon, garlic and olive oil dressing along with the chickpeas, makes for a delicious taste and texture collision for your taste buds. Preheat the oven to 150 degrees fan forced. Toss the vegetables in olive oil and place on a tray. (Don't put the asparagus on yet). Roast in the oven for forty five minutes to an hour or until cooked through. (Add the asparagus about ten minutes before the other vegetables are ready). Take the garlic off the tray to use for the dressing. Keep the other vegetables warm while you do this. Remove the garlic from the skin and blitz in a food processor with the juice of a lemon and olive oil to taste. Warm a cup of chickpeas on the stove or in the microwave, then drain. 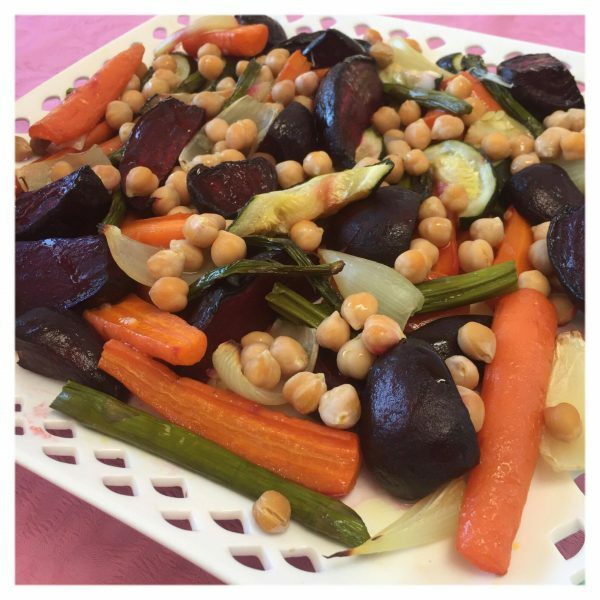 Serve up the roast vegetables onto a plate and scatter the chickpeas and garlic and lemon dressing over it all. Enjoy! 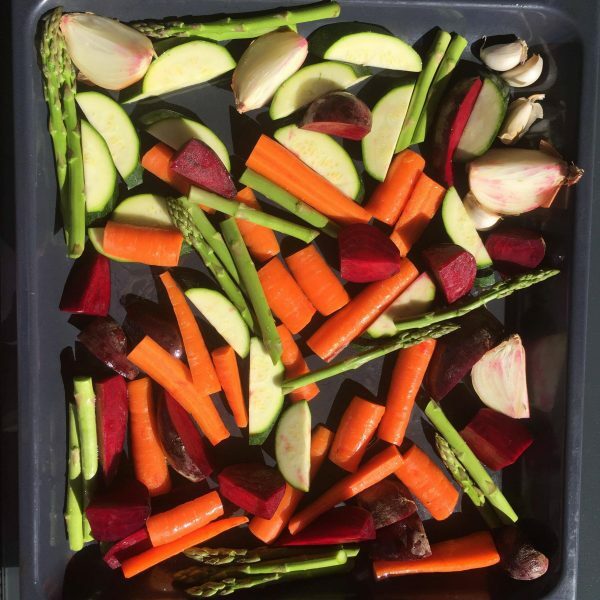 This entry was posted in Blog, Recipes, The Organic Place and tagged easy recipe, organic asparagus, organic beetroot, organic carrot, organic vegetables, organic zucchini, Roasted Vegetable Salad, roasted vegetables, The Organic Place, vegetable salad.